Hey Creative Souls! This is my first foodie printable as I am a bit of a foodie and I know for others, like myself, being creative in the kitchen is a very nurturing thing both for myself and my loves ones. What do you like baking to nurture yourself and your loved ones? Is it bread or cakes maybe? I know most people love bread, especially in my house and I just love the smell of bread baking in the oven, not that I do it that often, but it’s a real comforting Sunday afternoon treat. I am going to be working on a few other foodie illustrations in the next few weeks so I thought I would start off by offering out this free printable. 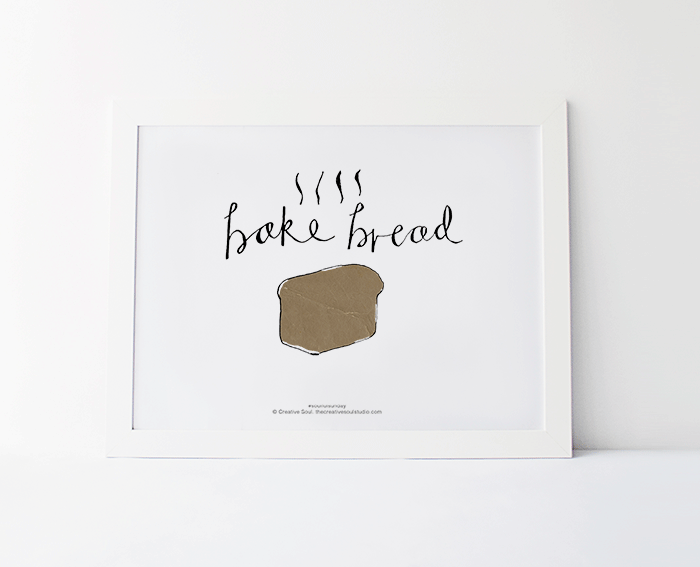 I hope it inspires others to bake their own yummy bread too! Please share this with others you think might like it and share your print outs on Instagram or Facebook. Enjoy!